Ethically Handmade Fair Trade Products from over 30 Countries. In Each Product you Sense the presence of the Culture behind it. Personal Gifts from a Personal Source. 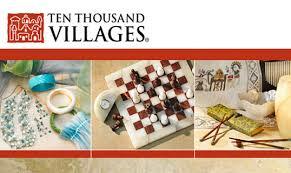 Ten Thousand Villages provides you an exceptional opportunity for unique handmade gifts. All the products represent the different cultures in which they were made by real people. The artisans are from countries like Asia, Africa, Latin America and the Middle East. You get a story behind each unique product. A great thing is that you can read about the artisans, where and how the artifacts are produced. From one culture to yours! It's a great opportunity to get your loved ones a unique and ethically sourced gift. Get presents for yourself, your friend or as a memorable wedding present. The sense of the cultural roots where these artifacts are crafted is everpresent. A personal gift from a personal source. Ten Thousand Villages is one of the world's largest fair trade organizations and a founding member of the World Fair Trade Organization (WFTO). The company strives to improve the livelihood of tens of thousands of disadvantaged artisans in over 30 countries. Read about the villages where the artifacts are made and the artisans.